Adult cats spend approximately 65% of their time sleeping, or nearly 16 hours per day, though it’s mostly a light sleep. Only 15% of their time is spent in deep sleep. 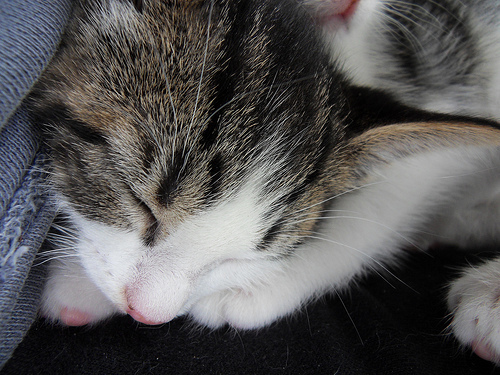 Kittens, by contrast, alternate between deep sleep and being fully awake, dividing their time equally between these two states for the first few days of life, after which they gradually evolve the adult cat sleep pattern. There is some scientific support for the memory-forming hypothesis. Researchers have found that kittens exposed to visual stimulation during the critical period for visual development form far more brain connections during sleep than kittens that are kept awake after visual stimulation. In fact, even if they’re exposed to more hours of visual stimulation, the sleep-deprived kittens don’t form as many brain connections as those allowed to sleep after the first session of visual stimulation.